This August, the Martin H. Bush Outdoor Sculpture Collection will have a new installation from Tom Otterness, the creator of WSU’s beloved sculpture Millipede. 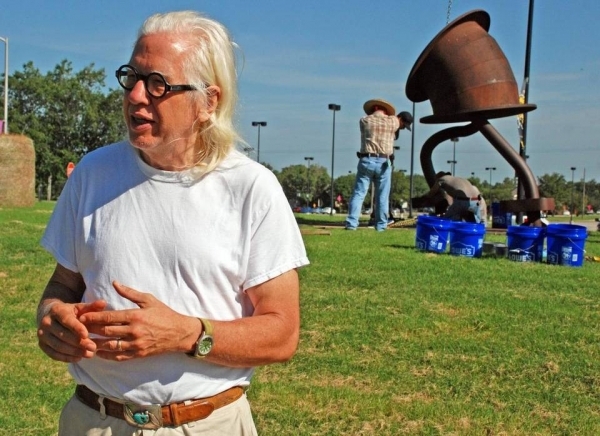 Tom Otterness’ Makin’ Hay will be placed at the intersection of Perimeter Road and Mike Oatman Drive. Makin’ Hay, a group of three 18-foot tall sculptures, has been seen most recently at Crystal Bridges Museum of American Art in Bentonville, Arkansas. The group sculpture will be on loan to the Ulrich until the summer of 2017 through the generosity of the Alturas Foundation.